This is the last shark week snack idea I’ll publish. I promise. Ok, so I lie. I might publish another–but just not this week. I’m all tapped-out with ideas. But this is kind of the best one. 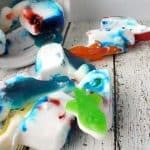 I liked the Shark Attack Cupcakes and the Shark Attack Ice Cream–and the Shark Attack Float is DEFINITELY the yummiest, but these Shark Attack Magic Milk Cubes? Fun, funny, and kind of killer for the kids. 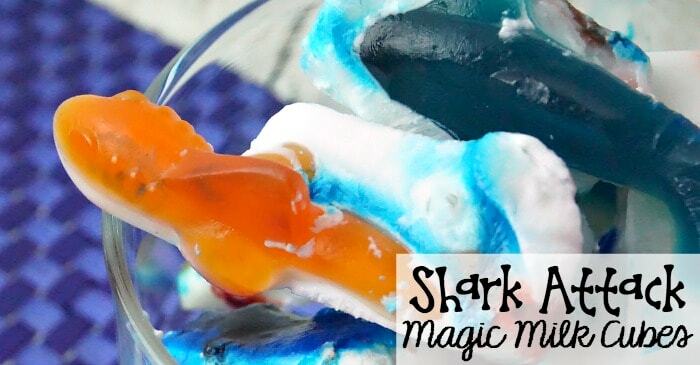 Ok, so here’s the magic, explained because the pictures didn’t do it justice…So, you pour your Shark Attack Magic Milk Cubes in a cup of milk and the food coloring starts to do it’s magic. Like it starts with the cubes sinking (because they’re not made of water, so they sink…get it?). So, if you can do this without your kids knowing–then when the coloring starts to melt and come up…do you start to get the picture? The blue comes up and a little red–and out of nowhere after a minute, the shark starts to come loose and BAM! 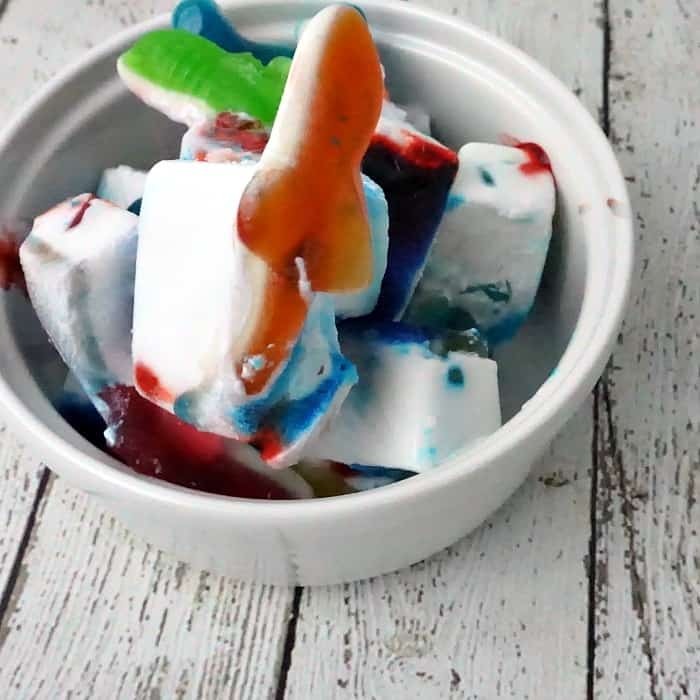 Your Shark Attack Magic Milk Cubes come-up true to their name and a shark comes floating to the surface of the blue milk…a little red mixed-in…And your kids squeal and think it’s funny. So. Yeah. That’s it. My kids thought I’d lost my rocker. They were so surprised and I was laughing…they caught on, and chowed-down on the shark pretty quick. But they weren’t expecting it. Not at all. And I was so amused. So. Freakin’. Amused. And, just in case you need a little giggle, here’s a few funny Shark-Things…that are awesome. Heh. If your kids like it as much as my kids did…drop me a line in the comments. I’d love to know if they squealed. LOL! 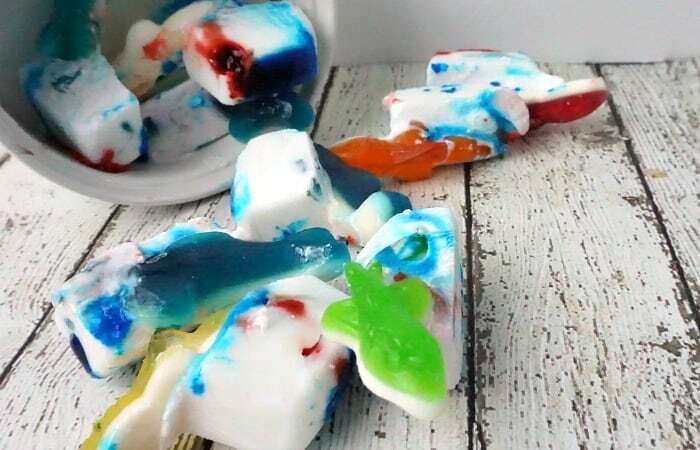 These Shark Attack Magic Milk Cubes? Fun, funny, and kind of killer for the kids. Using an ice cube tray, fill each cube cup 3/4 full of coconut milk. Put 1 drop of red food coloring into each cup. Put 2 drops of blue food coloring into each cup. Balance just the tail of a shark in each cup. Place in the freezer for a minimum of 4 hours. Remove from the freezer and drop 1 in a glass of coconut milk. Serve and wait for the fun!